Unit 35C Lot 103; TOT ID# 1632. 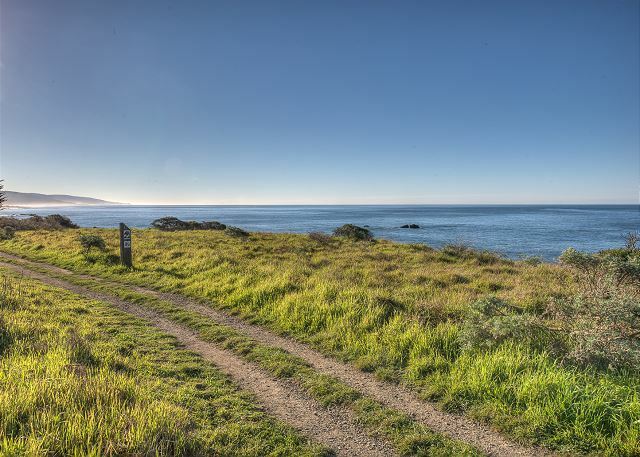 A few dozen steps from the sliding doors of Oceana Roll, California ends and the Pacific Ocean begins, marked by the three-mile long Bluff Trail. 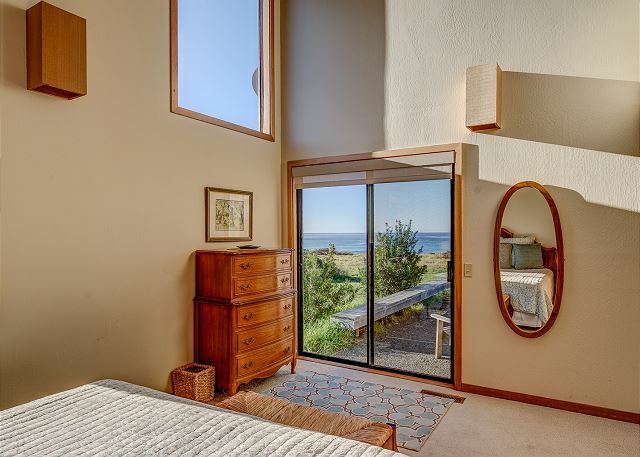 In every season, this dramatic intersection of land and water, viewed from almost every room of this warm, comfortable home, holds breathtaking surprises: spouts from humpbacks and gray whales, rafts of sea lions, pods of dolphins, ribbons of brown pelicans flying low along the water's edge, and even a great blue heron who visits from time to time. Bring binoculars and watch as osprey, kites and other raptors drop suddenly from the sky to snare prey from land or water. 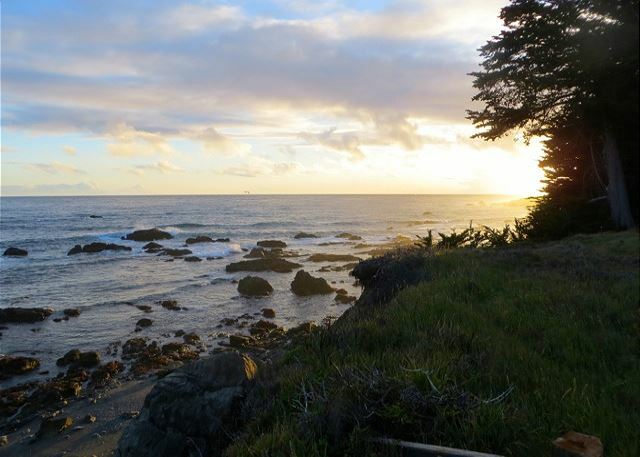 Each season at Sea Ranch has its delights. In the fall, a carpet of sweet-tooth hedgehogs, chanterelles, matsutakes, and porcini in forested areas entice mushroom hunters. Spring brings newborn wildlife--fawns, fox kits, and baby seals, as well as wildflowers--seaside daisies, milkmaids, lupine, calypso orchids and the hard-to-spot Fetid Adder's tongue, among others. 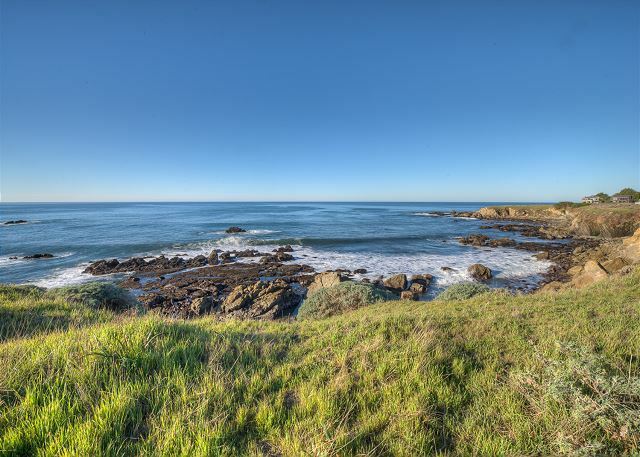 Spend summer days on uncrowded sandy beaches, explore tidepools filled with mussels, starfish, and anemone, kayak on the nearby Gualala River or play golf. Winter brings stormy weather, dramatic seascapes, rainbows and sunsets that defy description. No two are alike. 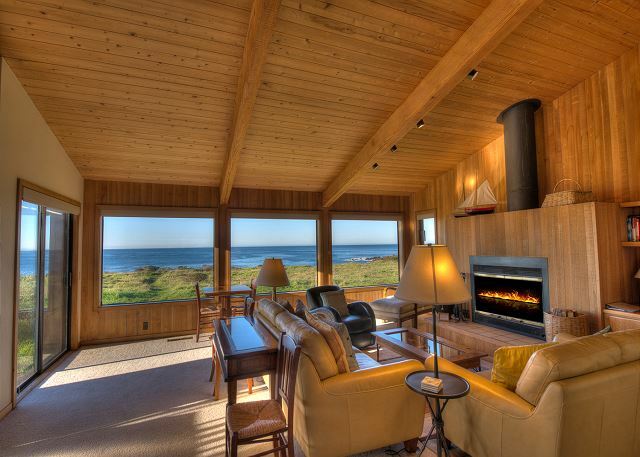 Quiet days in front of the fire watching the waves crash at high tide are some visitors' favorite memories. 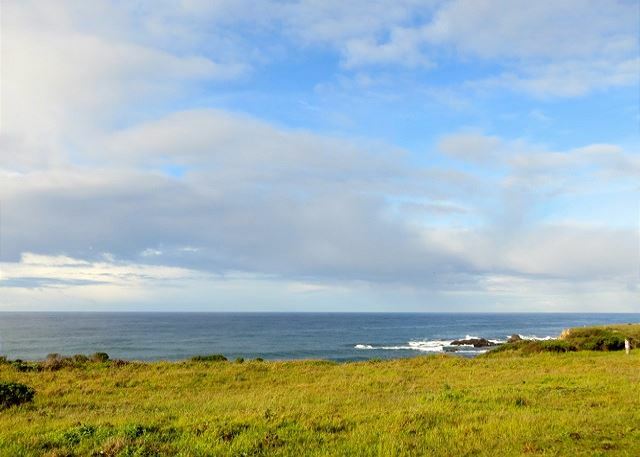 For birdwatchers, Sea Ranch is paradise: visit during December and take part in the annual bird count. Oceana Roll celebrates the sea and is named for a song sung aboard an ocean liner. Its spacious rooms with walls of windows offer 180-degree views of the water. Comfortable leather couches and chairs in the living room, along with HD TV, a DVD/CD, and an assortment of books and games provide entertainment after the sun goes down. The master bedroom and bath are separated from a second bedroom and bath by the entrance hall, which offers multiple guests privacy. 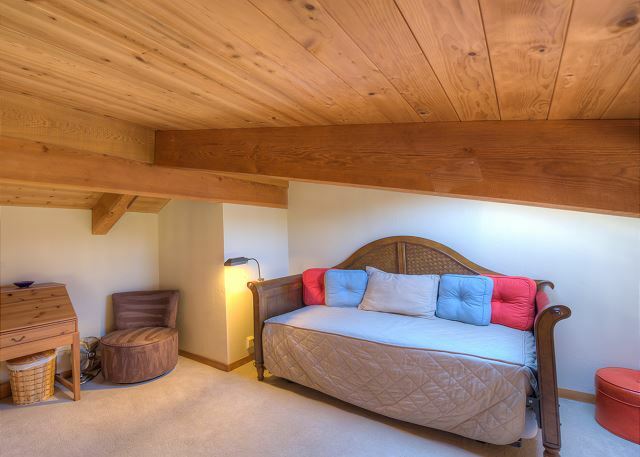 A loft above the large, well-equipped kitchen includes a daybed and trundle bed. Outside, an L-shaped deck with Adirondack chairs and lounges runs along the south- and west-facing sides of the house. A spa and outdoor shower are located in a separate, enclosed, wind-free courtyard amid hedges of lavender and pots overflowing with succulents. The courtyard's walls slide open for views of the ocean and close for privacy. The garden entrance to the house is also enclosed, which is helpful for guests who bring a dog. The garage is available to guests, and has room for two vehicles. Oceana Roll is located less than a mile from the Sea Ranch golf course, and just a short walk from the Del Mar Center with its beautiful, heated pool, saunas, and tennis courts. Dog lovers gather at the Sea Ranch dog park, also nearby, to give their pooches some off-leash time. 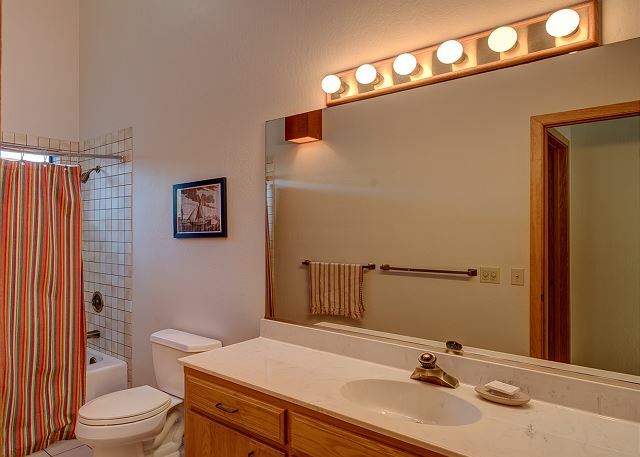 Due to its proximity to the bluff, the homeowner suggests guests age 10 and over occupy this home. We had a lovely stay at Oceana Roll just prior to Thanksgiving. 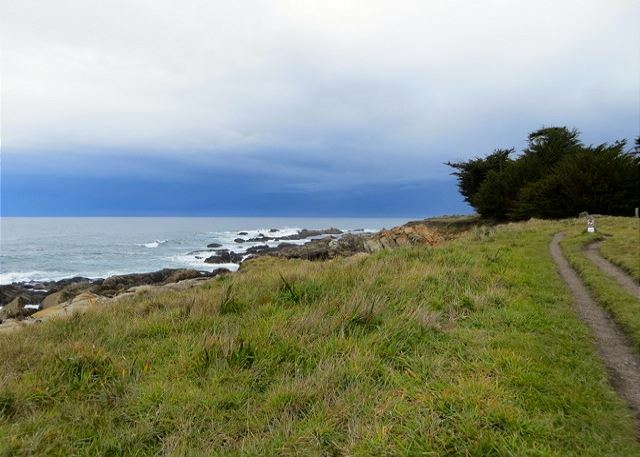 After having studied Sea Ranch in college, it was our first visit. I described it as “architectural catnip” to my spouse and we’ll most definitely be back. The five of us (me, my spouse, our two children, my father) plus two dogs had a marvelous time. Trail walks, beach visits, tennis, pickle ball, swimming pool, dog park, board games, avid book reading, bird (and seal) watching, dinner at Gualala Hotel — think that we ticked most of the boxes. This lovely home was the perfect base for it all. Can’t wait to return! Beautiful house, right on the ocean. Best library I've ever seen. Quiet. Incredible night sky. Only problem was that the large right burner on the stove didn't work. Minor problem, tho. Also the coffee table was cumbersome and I got horrible bruises from walking by it! Renting Oceana Roll was a complete pleasure. This is the third time we have been there and I hope to come back again. Great place and amazing location. Enjoyed the condo. Kitchen is well equipped. Proximity to cliff trail is awesome. Smoke alarm in master bedroom wouldn’t stop buzzing the last 24 hours and we couldn’t reach it to take battery out. No sleep the final night. Appreciated having an enclosed outside space for our dogs for when we went to a restaurant we couldn’t take them to. I and my guests had a lovely time, the location of the house and the comfort of the home being major contributing factors. Two things which could be improved: an armoire and a dresser in the loft would justify advertising the house as "sleeps six". Two of us stayed there and we had no place to either hang or store our clothes. Also, the filter in the loft needed to be cleaned, probably because smoke from the fireplace has clogged it over time. So peaceful, so serene, so many whales. 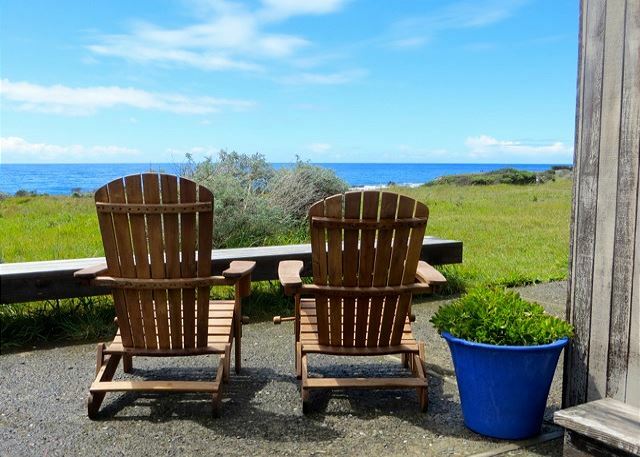 Oceana Roll is a home we have been renting for ten years and it always provides a beautiful Sea Ranch experience. It was really excellent. The house was warm and cozy with the fireplace. Our dogs were very happy. Amazing views. We saw whales, gorgeous sunsets, and even had a heron of some type walking around right outside the oceanview window. We had a fantastic time. The location of the property couldn't be much better. It was close to town and the golf course. It had a full ocean front view, only about 75 feet from the cliff edge. The sunsets were gorgeous. The wildlife was amazing. My wife and I loved walking the ocean trails. Besides us loving it, our dog loved it as well. I've never seen her so happy. The only issue I can think of, and it was truly only a minor issue, was that the amenities were a bit dated. I also wishd they had a barbecue. Thank you for your wonderful review of the Oceana Roll home. We at Beach Rentals are happy you were able to take advantage of our amazing area with the trails and sunsets. We are sorry that you did not notice the BBQ that is stored in the garage when you were here. We keep it in the garage to prevent rust from the ocean air as much as possible. Please, next time you are here, feel free to give us a call if you are missing anything we will be happy to help when we can. Great house on the bluff! We loved the location for hiking the trails and playing golf. The only negative was a mouse destroyed my vest that dropped from the hanger onto the floor one night - ouch! Get the mouse traps out! Lovely location and home. A bit dated, but not too unlike many of the homes at Sea Ranch. The home was stocked with all needed amenities, including a well stocked kitchen. The view was magnificent! We thoroughly enjoyed our weeklong stay at Oceana Roll. The house has a panoramic view of the ocean -- from all rooms. 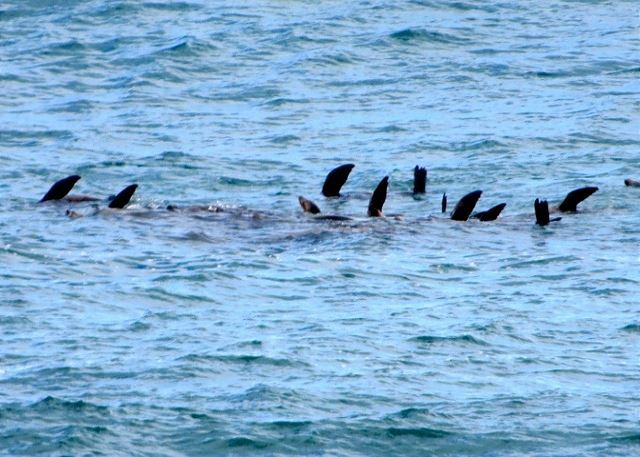 We were able to see several whales from the comfort of the living room, and it's only a short walk to the bluff trail. The kitchen is relatively well equipped, and (for the first time in our 30 years of rentals) even has a good set of knives. In addition, with the exception of a sleeping loft, the house is all on one level -- there aren't even any stairs to enter the house. This makes Oceana Roll a very good choice for any guest who has limited mobility or difficulty with stairs. (So many rental homes have several changes in elevation, including steps between bedrooms and bathrooms, which can be difficult. This house was very easy to get around for everyone.) The house also has an enclosed courtyard, a helpful touch if traveling with a dog. 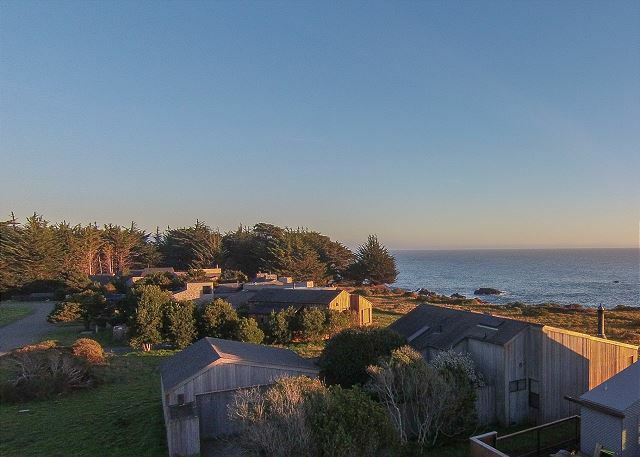 This was our first time to rent a home at Sea Ranch after selling our Sea Ranch home many years ago. 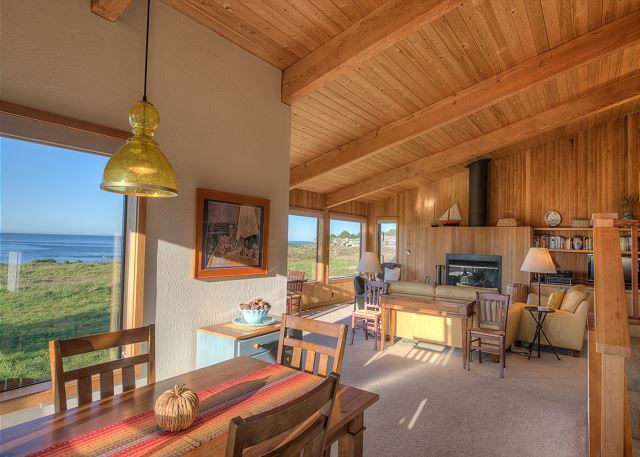 We chose Sea Ranch because we were familiar with what it had to offer and the large selection of vacation rentals. Oceano Roll is a nice enough home, with a lovely view of the ocean and far enough away from the trails where you don't have folks walking near the house. We liked having a garage and closed inner court areas for our small Yorkie. She didn't like walking so much because the winds were up our entire visit. The interior of the home had comfortable furniture and beds but no linens or towels, they cost extra. Everything worked in the home but it was quite dated. Only one small TV in the living room and old shower heads. We had quite a problem with spiders while we were there even after the pest control came to spray. The owner has placed signs with instructions everywhere so you can't forget what you are supposed to do. It kept us amused. We would recommend the property but with reservations. Oceana was peaceful quiet and relaxing. Helpful in renewing health and spirit. One of the most beautiful places we've seen. House comfortable and cozy. Truly more than we expected. Hope to come again. Oceans Rolls is very clean and well located. We rented the linens, and the bedding was in excellent condition. Towels not so much. Kitchen utensils, pans, etc. need refr aging ( only 3 large cereal bowls). Really needs a new large coffee maker. Lovely, clean and spacious home with excellent views of the ocean. Beach Rental staff always helpful and polite. Fantastic vacation for family & friends. We all really enjoyed this home & our stay there. What a relaxing stay! We thoroughly enjoyed our stay. As we cook, we were particularly happy with the kitchen amenities. It worked out well, as did the BBQ (we had a few friends visit for dinner) and hot tub. It was a terrific place for our dog, who got quite used to multiple walks along the bluff every day. It is a lovely home. 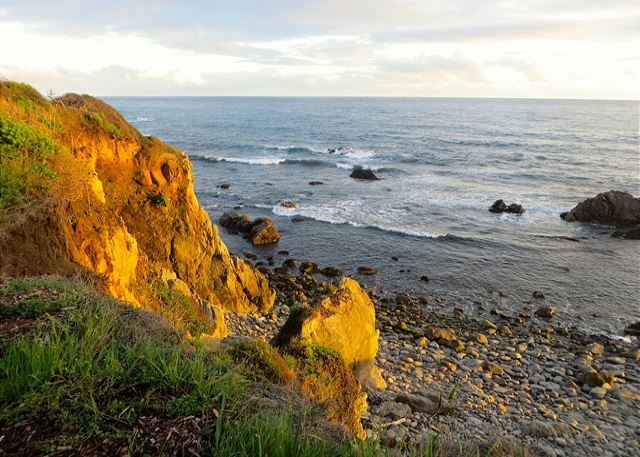 Nice walks south to the beach or north to Gualala Point. Only dings: truly awful pillows. Bring your own (relieved we brought a couple), along with your sheets and towels (including kitchen towels - not really a ding because we knew no linens were provided up front). The stereo essentially doesn't work and there wasn't a way to use digital music with it, but the Dish music stations worked fine. Think about bringing your own music set up if that is important to you. All things that have solutions, even if for the price workarounds shouldn't be necessary. That said, I would likely stay here again. We had a super long weekend. We had a wonderful view from this house. We saw whales everyday throughout the day from the living room and deck. They were playful and even jumping out of the water. The kitchen is not stocked excessively well, but had everything you would need. The hot tub was great and although it is behind the house there are doors that open on the sides and you can see the ocean. Will be back again for sure! We had a wonderful team building weekend at the beautiful Oceana Roll. The only thing I would have wanted more blankets because it was so cold this last weekend. The views were amazing and everyone had a blast. 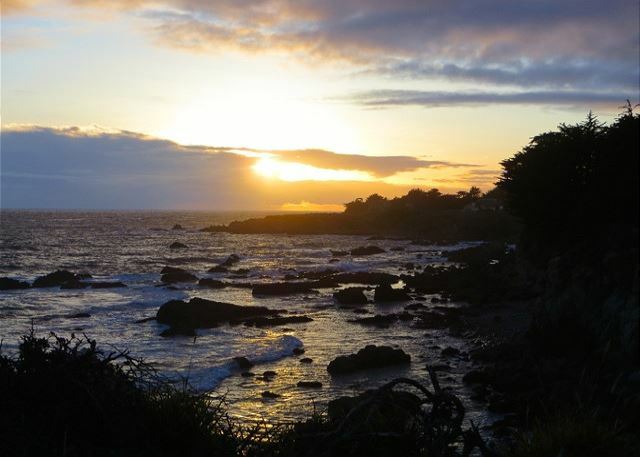 We have stayed at the Sea Ranch in the past and enjoy the coast, the quiet, the amenities and the unusual architecture. The office was easy to find and everything we needed was given to us in the packet and explained to us. It was seamless all the way through. The house was simple, but had everything we needed and the simplicity added to the experience. The view was amazing. Falling asleep and waking to the sound of the ocean was lovely. We used the hot tub every day. We would certainly rent this house again and use this agency again. Lovely well equipped home. Works very well for our disabled friend. Wonderful view. It was so nice to just relax and look at the ocean. Very peaceful. Our little dog loved it. Thank you so much for allowing us to bring her. Everything was great except we didnt find the furniture all that comfortable. It does look great though and modern. All in all a great stay! Our Sea Ranch rental home was about 100 ft from the ocean cliffs. 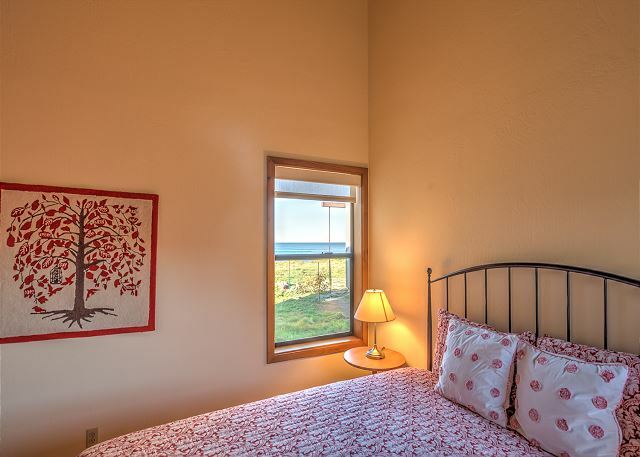 The views of the ocean were wonderful including the master bedroom. Bumbles (our rescue dog)had a great time inside and outside the home. He especially enjoyed laying in the sun on the bench outside and being one w/the tranquil world. It was the same w/us, except we preferred the chairs. We read, played games, painted, explored, walked, everything was at our pace. The home was comfortable, well supplied kitchen, good market about 5 minutes away. We came home w/the same glow we get from Hawaii. 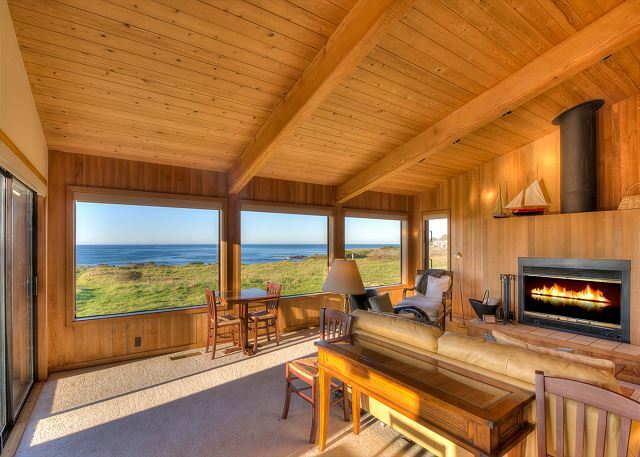 This house is the most beautiful house to stay at Sea Ranch for a relaxing, luxurious, calm, and invigorating time. 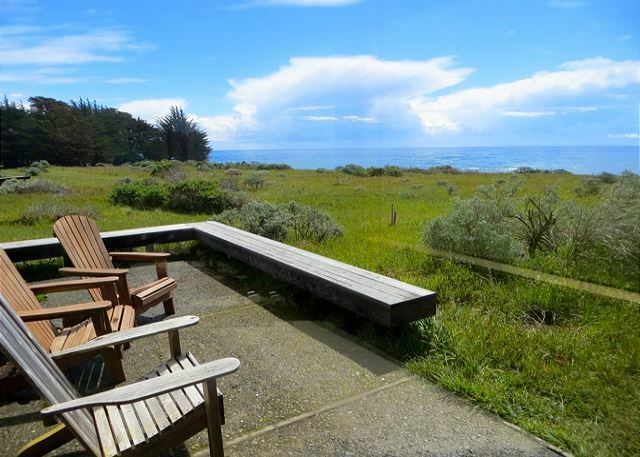 The hosue is placed perfectly on the bluff overlooking the Pacifc Ocean. Close enough so that you can enjoy the view yet far enough removed that other people walking the path that runs along the bluff aren't looking into your windows and seeing what you are eating or drinking. The walking path along the bluff is one of the most beautiful walks in nature. The path is full of bird sounds, ocean sounds and smells, wonderful and natural flora & fauna. With 2 or 3 miles in either direction, you can walk without running out of path. There are beaches slong the path that you can walk down on and hang out. The house has a hot tub with a marvelous view of the night time sky as well as privacy doors that maybe opened for a view of ocean. Accomodations are up to date, comfortable. Just a glorious stay! Magnificent location, all the necessities, and best of all, dog friendly. Looking forward to coming back. Only got to stay four nights - a month would have been much better. Proximity to the bluff trail was great and the house well maintained. Minor details like the lack kleenex, salt and pepper, better cooking utensils were a negative but the garage and dry fire wood a real plus. Will stay there again in a minute. Excellent, overall. Very relaxing. Very comfortable house. Beautiful setting, as usual. We loved the house and the location. 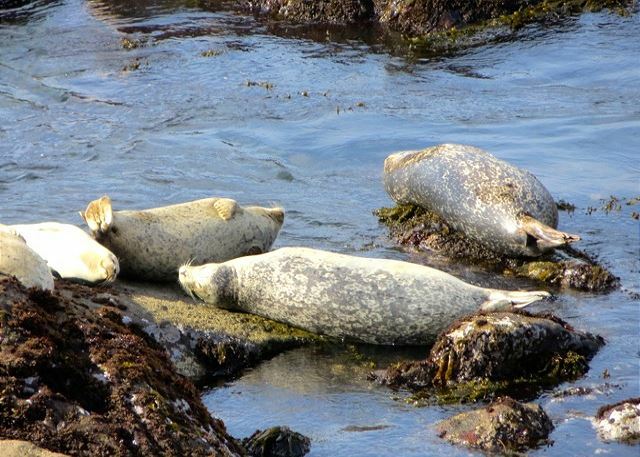 Taking walks along the beach we saw numerous grey whales, sea lions, and seals. The weather was perfect. The house was very light and open which was perfect. We had a great time (4 nights). The house was just perfect for the two of us and our dog Max. The location was great for long walks along the bluffs and the weather was perfect. This is a terrific house in a great location. My family and had a lovely stay at Oceana Roll. Watched beautiful sunsets and even saw whales. We'll be back. The house was warm and welcoming. The kitchen, supplied very nicely with everything we needed. The furnishings, tasteful and just right! The best part was being so near the ocean and the coastal trail. We took long walks each day. In the evening we sat out on the deck and watched the gorgeous sunset. Our small dog had a great time too. A perfect getaway! 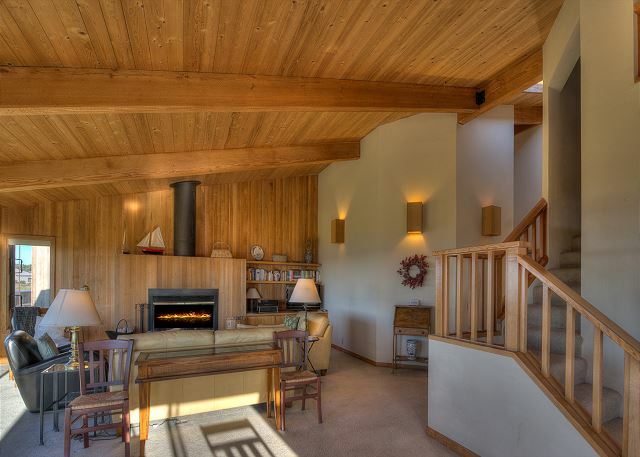 We have been coming to Sea Ranch for many years and stayed in many different homes. We always bring a good friend that is disabled and this home is perfect for her. 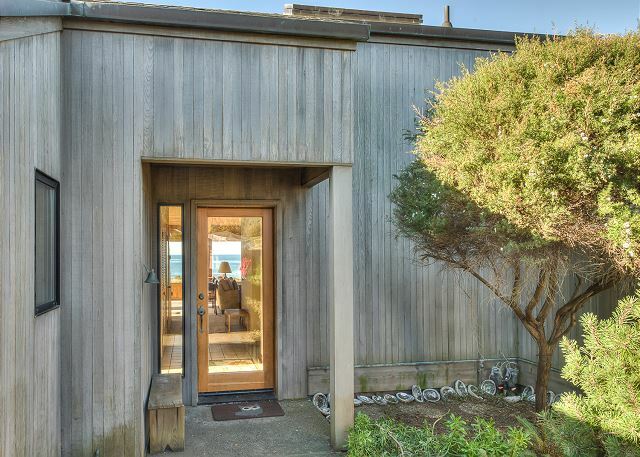 Great access to trail, wonderful oceanfront location, with private hot tub in courtyard. We had a terrific, relaxing few days. New construction next door was not intrusive. Wonderful place, but picture of house should be changed because the house is no longer isolated on the seacliff--in fact surrounded by very close houses. I thought pricing was too high. Beds were very hard. Overall though, it was a lovely retreat. Our 3 nights at Oceana Roll were peaceful and refreshing. The property had been rented to us at a discount because of "construction" next door. From one bedroom, a bit of work was audible with a hammer one afternoon; throughout the rest of the property we heard nothing at all from next door. The windows have a clear view of the ocean. When at home, we sat looking out at an ever-changing vista of sky and sea, the windows open to catch the smell of the sea air. The trail atop the bluff is just steps away, and runs for miles along the sea. 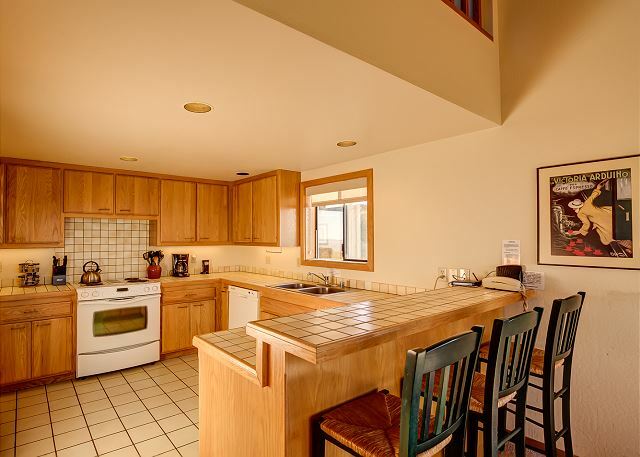 Nthe kitchen was well equipped, and the property clean and very comfortable. The trundle bed in the upstairs loft is best for smaller children; my 20 year-old son was too long for it, at over 6 feet, but he managed. The beds downstairs were extremely comfortable. Our dog had a treat waiting for him, and a towel provided for his feet. We felt welcomed and well provided for, all around. Best Father's Day ever. Spent quality time with my grand children creating memories for them. It was fun. The experience was a relaxing one. The view from the house was scenic and awe inspiring. There were enough amenities at the residence to make the stay a comfortable one. Kathy Grace and the rest of the staff are accommodating and welcoming. Great experience. 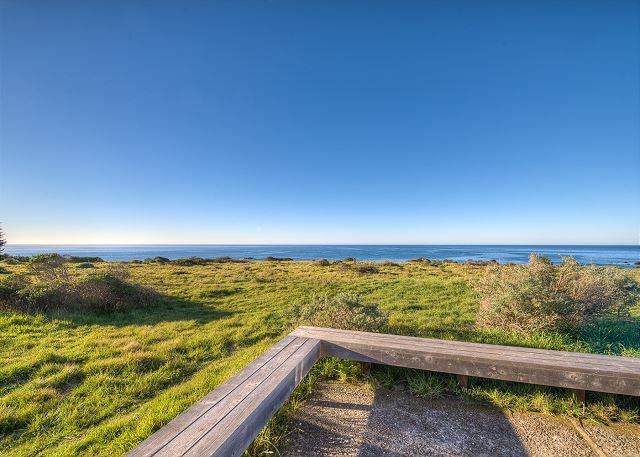 The location was greaT BECAUSE WE always choose a bluff house BUT we FOUND THAT THIS LOCATION(A QUICK WALK TO dEL MAR POOL) WAS PERFECT ALSO FOR RUNNING/WALKING NORTH TO wHALE pOINT(5 MILE LOOP) OR SOUTH TO Walk-On Beach. 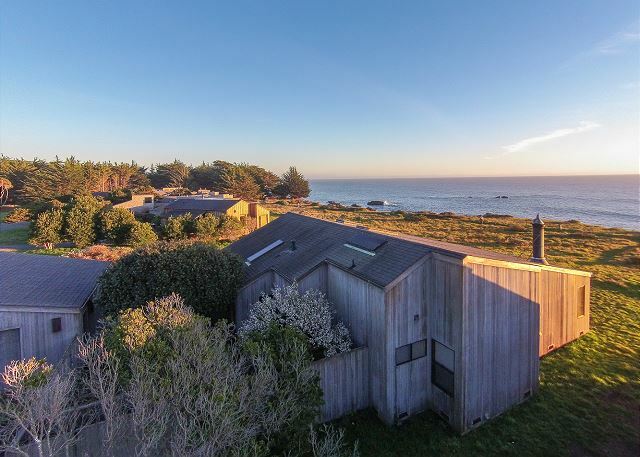 This house has been added to our best list of Sea Ranch houses, the only minus being the mattresses in the loft trundle...Everything else about the house was perfect including a kitchen with great pots, pans, bowls , and prep tools and utensils. We love Oceana Roll and the dog loved the enclosed garden and hot tube area. We will return! The house and setting were spectacular. We had absolutely no complaints about anything! We had a great time and bwill return. Thank you very much! We had a lovely time. Thanks for the discount because of the building going on next door as well. This is a great home for our disabled friend we bring every year. Wonderful location steps from the ocean. 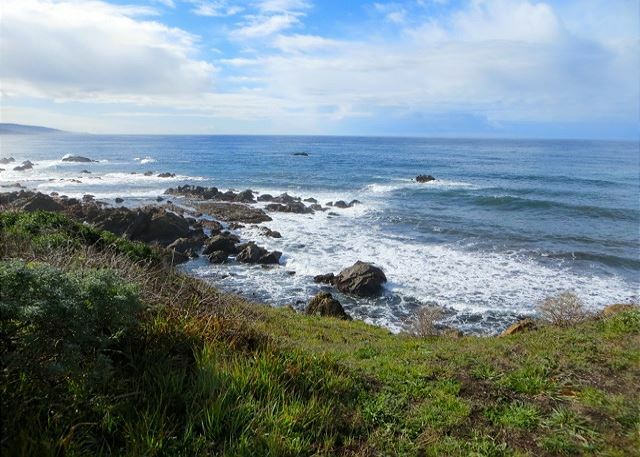 At north end of Sea Ranch so close to golf, Gulala, shopping. We had a low key, lovely time. Great home with wonderful views snd dog friendly. We truly enjoyed our stay at Oceana Roll. 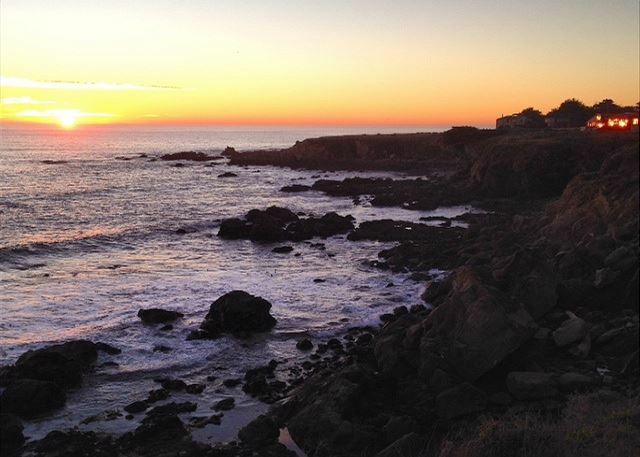 It was a perfect spot for our family to get away and enjoy the Northern California Coast. The house is very nice and the views are incredible. We would highly recommend this spot to our friends. The location was great, the views phenomenal, but the layout of the home was a little awkward. The hot tub's set up was uncomfortable. But overall, we enjoyed our stay. This was our first time to a pet-friednly rental as we have a 6-month old puppy. The staff at the rental agency are top-notch and professional! The home was exactly what we needed. Beautiful views, lovely sounds of the crashing waves. We have been coming to SR for years now and we haven't found a house we didn't like! Thank you SR ! 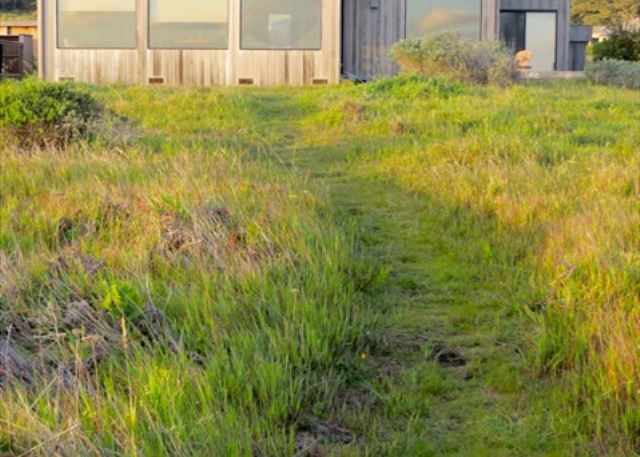 We returned to our favorite location, Sea Ranch to discover this lovely home. Perfect location and views all around. We did have a little trouble with the internet connection, but the owners' helpful hints helped us navigate back onto the world wide web. Great house! Great location! Great views! The only downside was the loft has a low ceiling. Perfect weather for a great location. Only complaints were could not get wireless connection and windows needed cleaning. Just what I needed to unwind. Perfect location. Beautiful house. It was so relaxing to spend our vacation in this house. The view was stunning. The access to the trails was right out the back door. Gotta book this place again for next year. We stayed 3 nights. Lovely place and would stay there again. We had an extremely relaxing stay at Oceana Roll. We loved the amazing view, whale watching, wildlife etc. We took advantage of the walking trails, and bike trails and had relaxing times after the exercise sitting on the deck watching the ocean's beauty. The home accommondations were impecable. 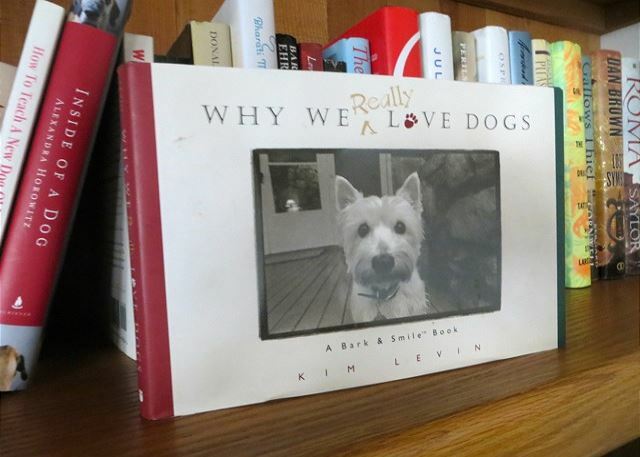 We had the best time together during meals, sitting by the fireplace, reading a book on the deck or sitting in the hot tub. Our puppy loved the experience of being with us well. We love the quiet peacefulness at TSR; staying at Oceana Roll completes the whole experience. My sister and I surprised our mom with a 4 night stay at Oceana Roll for her 90th birthday and it couldn't have been a better choice! She was so thrilled. The house is private and beautifully furnished with breathtaking oceanfront views. We walked the trails in front of the house every day, read on the patio and watched the wildlife from the living room windows. So peaceful and gorgeous! The Beach Rental staff was super helpful and personable, going above and beyond the call of duty I think, sending me emails prior to our stay with information about restaurants, shops, bakeries, the house, the trails ... all sorts of things they thought my 90 year old mom might enjoy. Very friendly and sweet! Ocean Roll has a great vibe and you can tell by reading through some of the guests' entries in the guest book that many happy and memorable times have been spent there. We will come back for sure! A comfortable, cozy (but big) place with a view you would not believe. We hope to make this a frequent vacation destination. Don't forget to bring your tennis racquets! My husband, daughter and her husband had a very peaceful stay at the Oceana Roll. This is the first time we have ever taken our dogs with us and they enjoyed the visit as well. When we arrived, there was a special package for our dogs which included a towel, sheet and bone. It was a wonderful touch! The rental staff were friendly and accommodating. We enjoyed our stay so much, we had to extend it a day. Though it was after hours when we called, Diana, the manager, was available to make the change for us. I highly recommend the property. 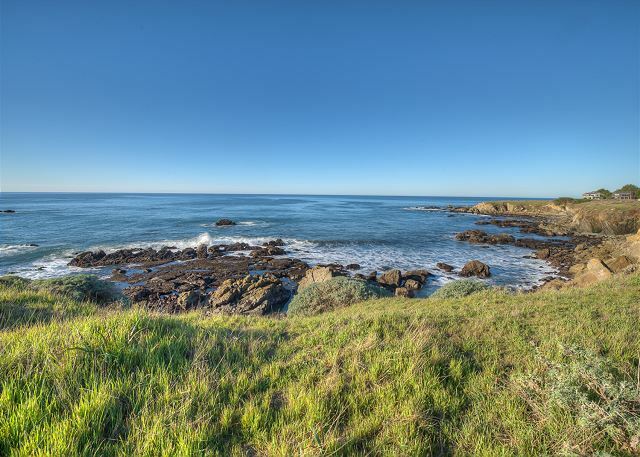 It is well located close to accessible tide pools and the bluff trail. The view of wildlife and the ocean is amazing. We will return! We thoroughly loved our stay at Oceana Roll. 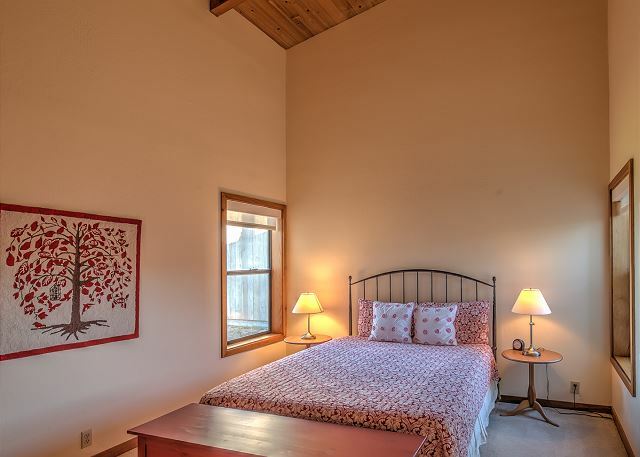 The location was perfect for us as it is quite private, has a stupendous view, and there is easy access to hiking trails. Other than wishing there had been a gas grill instead of the little Weber charcoal grill, we wouldn't change a thing. It was perfect!I would come again. I liked being able to walk to the DelMar Center for lap swimming, great pool. Wonderful location and comfortable home. Nearly white carpets are a bit of a problem for a beach rental. We miss the Great Blue Heron! This was a 6 day stay given as a gift to an older couple. They were absolutely charmed by the home, especially the daily visits by the Great Blue Heron. We visited for 2 days of their stay. The weather was perfect, the views of the sea unobstructed, and the walks along the bluffs were spectacular. Now that we are home, we miss our daily visit from the heron. The location is very serene and we found everything we had hoped for. The only regret we have is that we didn't stay longer. We will definetely come back to correct this error. We had a great time in a beautiful location. Would definitely come back again. The location was perfect with a breathtaking view of the coastline. In the past, and this is by far the best place we've rented. We'll be back! The accommodations are very comfortable with all of the amenities that made our stay relaxing and fun. The Beach rental staff is super nice too. They love pets too. Fabulous house, tastefully decorated and comfortable, great view yet private. Kudos to John the handyman, the owners, and Beach Rentals for getting the refrigerator replaced so quickly. Thank you so much for allowing dogs!!! We all loved our stay. 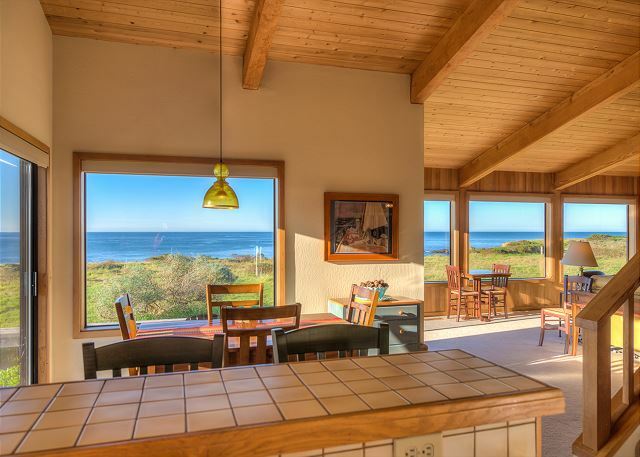 This is the best vacation home at Sea Ranch and Beach Rental staff couldn't be nicer. We have two dogs, the white carpet was a bit of a stress...other than that it is a great place! 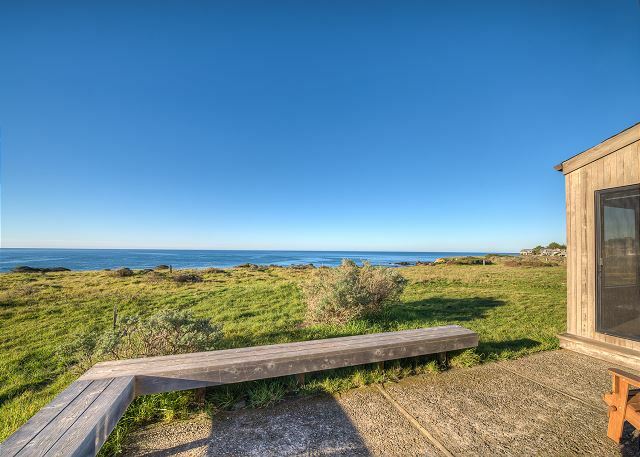 Oceana Roll is a lovely property perfectly situated right on the bluffs. It is nicely appointed, and we had everything we needed to prepare our meals. The white-water views are unparalleled, and the sound of the waves at night was heavenly and relaxing. We enjoyed our stay. 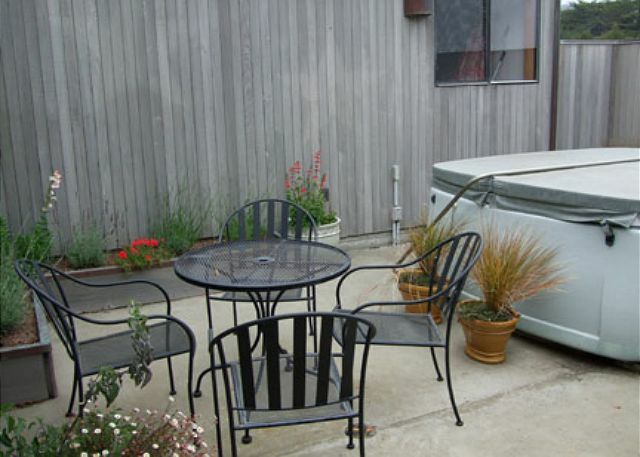 It would be great if a few things were included at Sea Ranch Rentals to make your guests' visits even more convenient: garbage bags, laundry soap, towels... Thank you for asking. Beautiful location and a lovely home too. I just wanted to thank your staff for your warm hospitality. Not only was the house absolutely wonderful but you made our trip the best ever with your friendly staff and perfect arrangements. We wish we have better BBQ Grill. We had the most wonderful time and could not have chosen a more beautiful or relaxing spot for our vacation. 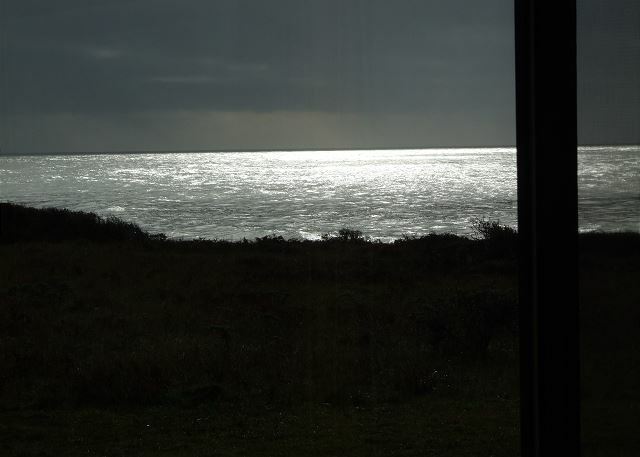 I think my favorite part was getting up in the morning to look out the windows and see 180 degree ocean views. The only problem was that the property appeared to be being worked on and there was some scaffolding on the side of the house which inhibited our view from the hot tub, but otherwise all was more than well. I would definitely recommend this property to anyone. 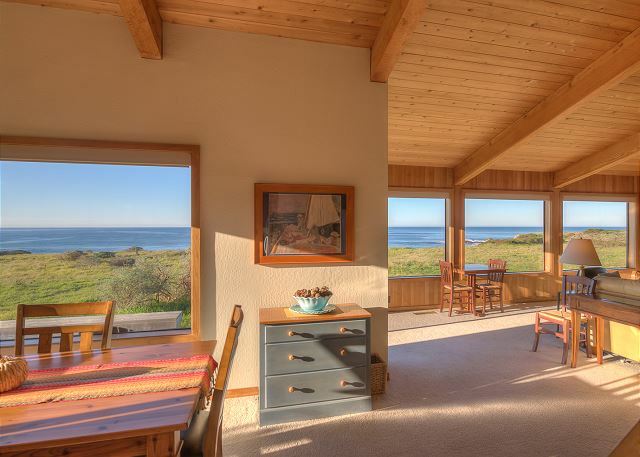 we have been renting in and around sea ranch for the past 18 years, this was a first class place. we paid more this time; but well worth it! We were really impressed with the whole service, from the original enquiry via the web to the documentation and quoting service to the keys to the property being made available after office hours. The house itself is absolutely superb. It was beautifully clean when we arrived and we had opted for the linen service which made the package complete. The location is breathtaking and the quality of the fixtures and fittings are of a very high standard, the inclusion of "How To" guides to the various electrical appliances was a nice touch and we made full use of all of them. Sitting in the hot tub watching the whales migrating and listening to the ocean crash onto the beach was fantastic. For many years, we stayed at this home, which was then called Sounding. It sold and went off the market for awhile. Delighted to see it back. 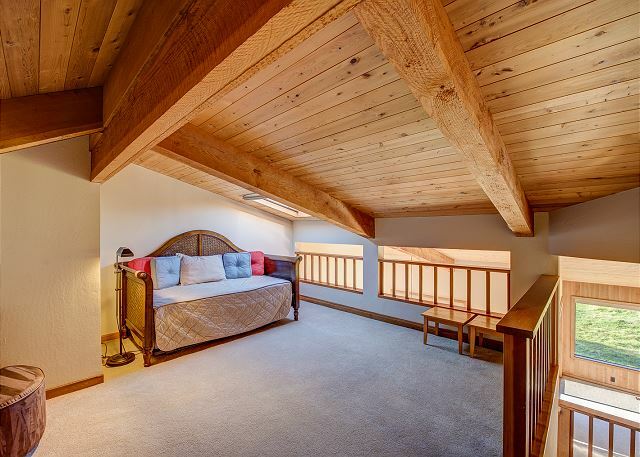 Very comfortable and cozy for one or two couples. Best firewood that we have ever had. Pine that actually burned instead of previous petrified wood. Biggest complaint is toilet paper. No need to get the lowest quality possible.